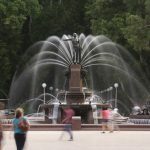 The Archibald Fountain is located in Hyde Park North at the centre of ‘Birubi Circle’, and at the intersection of the main avenues crossing Hyde Park. 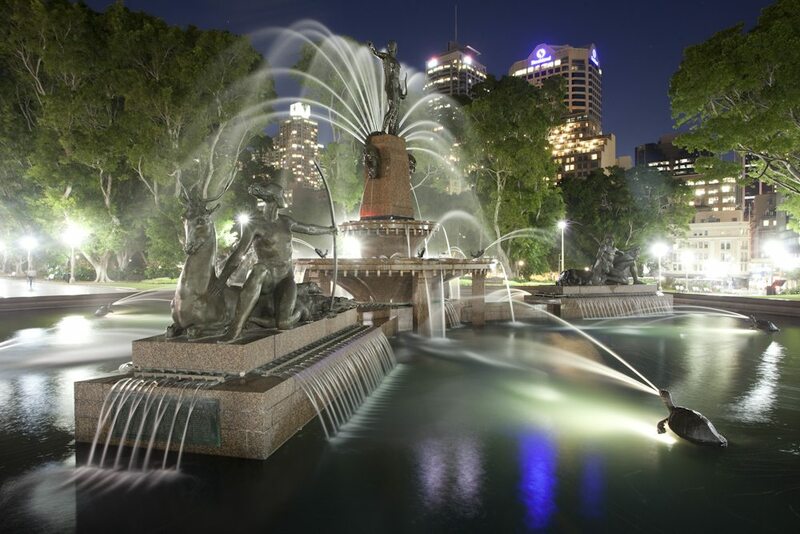 The fountain, by French sculptor Francois Sicard, commemorates the association between Australia and France in World War 1. 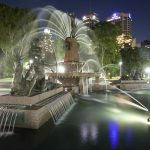 It draws its themes from Greek antiquity and is an important example in Sydney of the classical revivalist sculpture of the 1920’s and 1930’s, known as Art Deco. 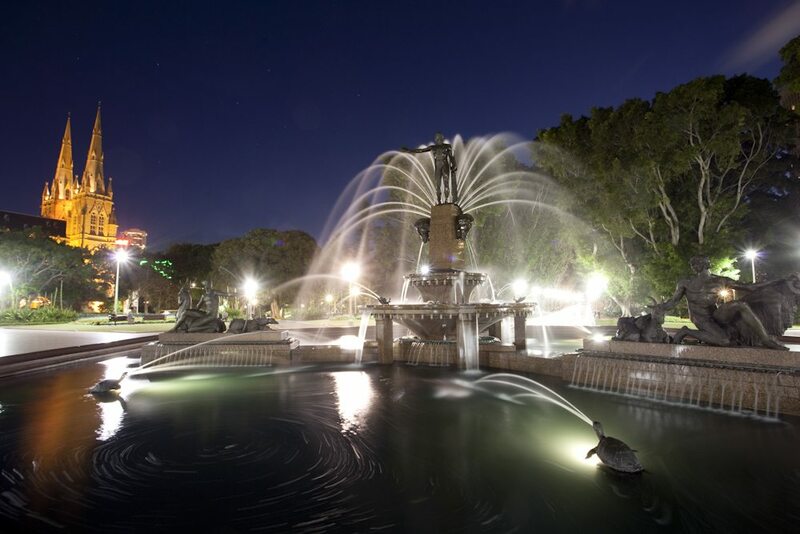 The fountain is approximately 18 metres in diameter and is in the shape of a hexagon. A bronze Apollo, the central raised figure standing approximately six metres high on a central pedestal, dominates the other mythical figures of Diana, Pan and the Minotaur. Behind Apollo a large arch of fine spray represents the rising sun and accentuates his dominant position. 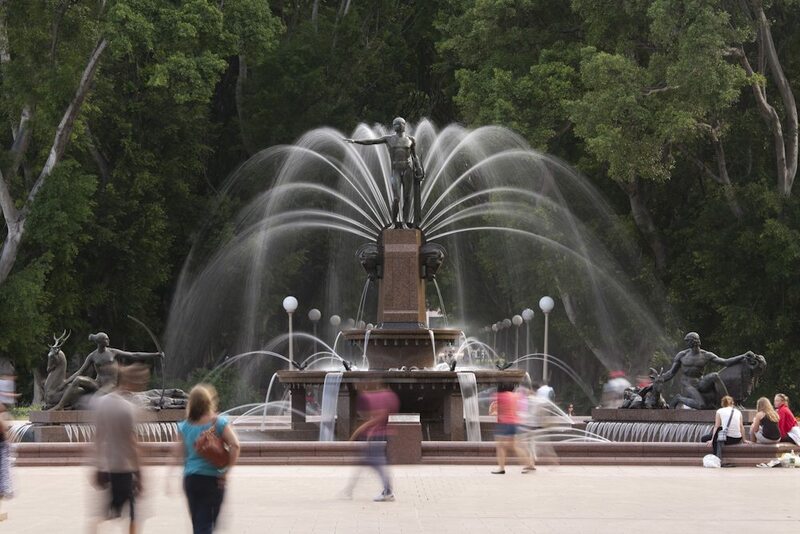 At Apollo’s feet, water sprays from horses’ heads into a series of three basins. Tortoises in the large hexagonal basin, and dolphins in the middle one, direct jets of water towards the centre. Apollo was surrounded by three groups of figures, the first featuring Diana bringing harmony to the world; the second, Pan watching over the fields and pastures; and the third, Theseus conquering the Minotaur, symbolic of sacrifice for the common good.